Is This a Cycling Blog or a Food Blog?? I haven’t eaten any satay since I came home to Kuala Lumpur almost six months ago. I mentioned satay in Another Place to Eat three days ago. We stopped for satay last night. Tuesday and Thursday nights have become KESAS ride nights. I wrote about this route, along the Shah Alam Expressway to give the road its proper name, in Another Uncle Wiggily. It turns out that there are two choices for a satay stop. Both are Sate Kajang Haji Samuri outlets. 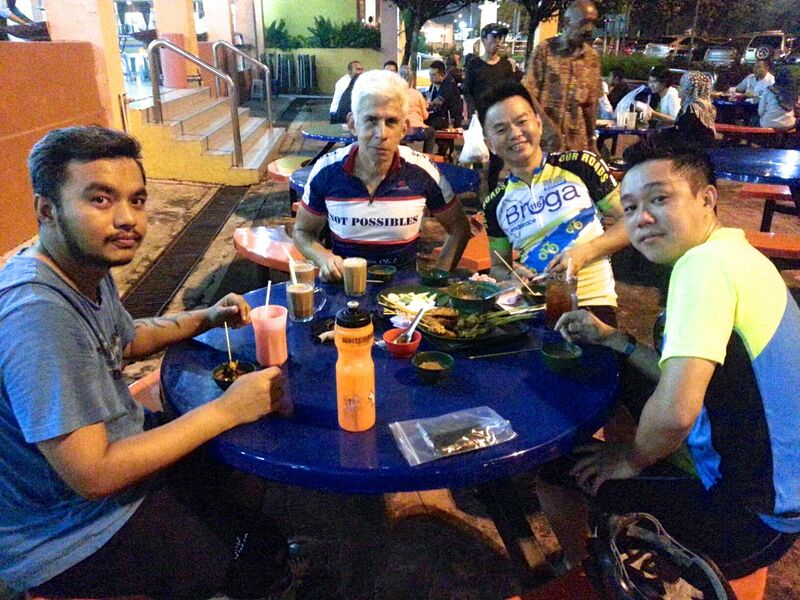 The first is about 10km into the ride, at the Taman Kinrara Rest & Service area. The other is on the opposite side of the expressway at the Awan Besar Rest & Service area. About 19km from the start. Chon chose the nearer one. Kajang has been traditionally known as the “Satay Town.” There was a time when you had to make the 20km drive south from Kuala Lumpur to Kajang to get authentic Kajang satay. These days there are numerous stalls and shops selling Kajang satay. 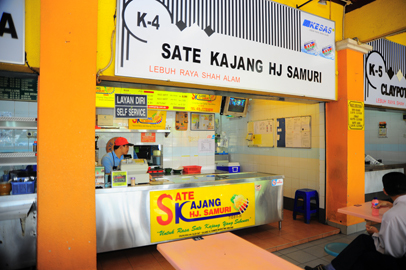 Sate Kajang Haji Samuri is a Malaysian equivalent of a fast-food chain. They have twenty outlets. Three in Kajang and the rest scattered around the Klang valley, Seremban and Port Dickson. If the quality of their satay is consistent across all their outlets, they are doing something right. We had chicken satay. It came piping hot from the grill. Tender and juicy, with the right hint of lemongrass in the marinade. 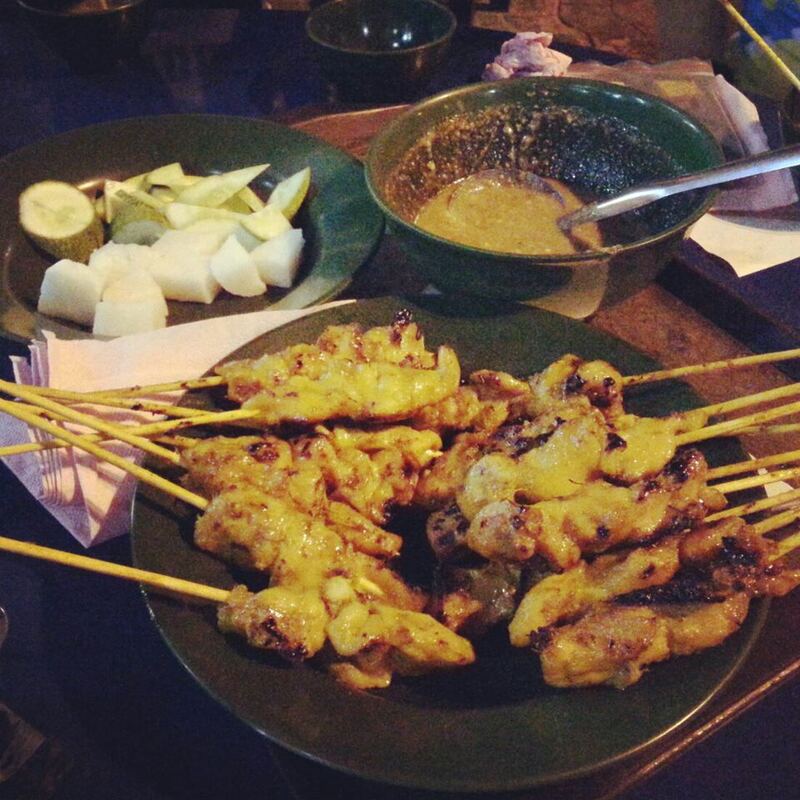 A key part of a good meal is the kuah satay or peanut sauce. This one was good enough to eat by itself. And in a nice touch the kuah satay and the sambal, or chilli paste, for the sauce came separately. So each of us could add as much or as little sambal to our individual bowls as we wanted. I skip the sambal completely. We also got a generous serving of cucumber and nasi impit, or compressed rice cakes. These are the traditional accompaniments to satay. There was a time when ketupat instead of nasi impit was served with satay. The difference being ketupat is cooked in a woven palm-leaf pouch, while nasi impit is cooked in a far less labor-intensive plastic pouch. Happy days for Gary, Chon, Chris and myself! As an aside, the short zip on my Not Possibles jersey may have been adequate for Dutch weather, but it didn’t work so well last night in the heat and humidity of Malaysia. Especially as we averaged about 32kph getting to the satay, and the same afterward to burn it off. That satay was worth the effort! Posted in Cycling in Malaysia and tagged Kajang, KESAS, Ketupat, Nasi impit, Peanut sauce, Sambal, Satay, Sate Kajang Haji Samuri, Shah Alam Expressway, The Not Possibles, WhatsApp. Bookmark the permalink.